S-u-c-c-e-s-s is a seven-letter word: the most important letter being ‘u’. Yes, success begins with you. It is a mindset, a way of living. The idea of success or what constitutes success is debatable, but it is your attitude that determines your victory or defeat. It must be your dream to top in a competitive exam like the CA Intermediate Exam, but not many can deliver on the hard work required to go all the way to the top. Are you willing to go that extra mile? Do you have the confidence in you? If you promise not to lose motivation mid-way, we can assure you of your success. It is both ambitious and prestigious to become an All India Ranker (AIR) in CA, and ambition when coupled with effort can surely take you places. For a dedicated CA aspirant, the sky is the limit. 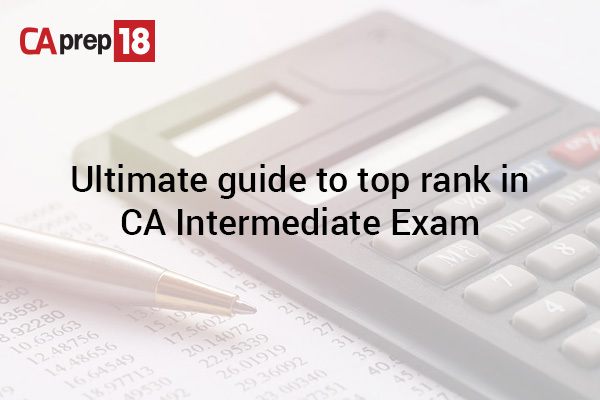 To secure a top rank in the CA Intermediate Exam, the following guidelines could help propel you in the right direction. 1. Plan your studies effectively: In most cases, students prepare for the CA Intermediate Exam alongside their graduation studies. So, it becomes important to map subjects accordingly. You should ideally set aside 12 to 14 hours a day to study for your CA exams. The best approach would be to come up with a date-wise, month-wise study plan that is evenly distributed among all subjects. Keep a track of your progress, and make amends in case you deviate from your plan. Include intermittent study breaks in your plan. It is crucial to your success that you take small breaks every few hours so you can return to studies fresh. 2. Take your time with key concepts: Maintain a concept register for each and every subject. Read each chapter minutely and segregate the most important concepts. Enter them sequentially in your register along with the various sub-topics. This would sound like additional effort to many students, but every bit of it is worth it. For any student who is aiming to score beyond just the pass percentage, it is crucial that you put in more effort than usual. Start your concept register with a neatly laid down index which should contain columns demarcating the list of chapters, the core concepts from each chapter and the stage of revision you are in. 3. Revise frequently: While coming up with your study plan make sure you have provisions for revision. Depending on your learning curve, it is going to take a minimum of 2 and a maximum of 4 revisions, till all the concepts run in your veins. This is where your concept register is going to assume an essential role. It will help you brush up the key notes from each chapter at a glance. Also, you can keep a track of how many times you have revised a particular chapter so that you don’t overdo one and completely leave out another. 4. Take your tuition classes seriously: You have the option of self-study, but most students find it reasonable to take classes to crack the CA Intermediate Exam. There are good reasons for the same. From professional guidance to real-time doubt solving, these coaching classes help you to tackle your syllabus. When your classes are on, you need not study too much at home. Just take time to mull over what is being taught. 5. Recognise heavy weightage chapters for each subject and treat them separately: Wondering how to do that? Identify heavy weight chapters from where you can expect sure shot questions. Give them more time and effort. For example, when you prepare for CA Intermediate Accounting, you should give more importance to crucial chapters like Accounting Standard. Refer to subject-wise books that deal with important chapters in depth. Prepare yourself to perfection in these areas, and you will have a sure-fire chance of bagging more marks. 6. Familiarise yourself with exam papers: Knowing all the concepts is one thing, but presenting them as answers is another. You should be careful about the way you present answers. In order to avoid any haphazardness, familiarise yourself with exam papers. This will give you a fair idea of what you can expect and an insight into how questions are set and how many questions you will actually need to answer. Let’s take this effort one step forward. Let’s say you collect last 10 years’ exam papers and minutely analyse them. This will help you know the most important chapters, and once you get down to solving papers, you will get into the habit of answering within the time limit. 7. Practise problems, set a timer: Yes, of course, you have to practise your way to perfection if you wish to score a good percentage in the CA Intermediate Exam. But that alone will not be enough. To give yourself the best shot, it is important to use a timer. (This holds true for all your practical papers). You should be able to feel the clock ticking, just like you would in the exam hall. Unleash the rounds of revision here, and keep going till you can solve each problem flawlessly within the stipulated time period. These guidelines when put to practice together should get you the score you desire. However, the most important guideline is to believe in yourself. When in doubt, when fear takes over or when the burden of being an achiever becomes too big, it becomes important to borrow a leaf from Winston Churchill’s motivational handbook: “Success is not final, failure is not fatal: it is the courage to continue that counts.” Believe in yourself, have the courage to pursue your goals, be diligent enough, keep consistency by your side, and together with these guidelines, we hope you achieve a high rank in your CA Intermediate Exams.